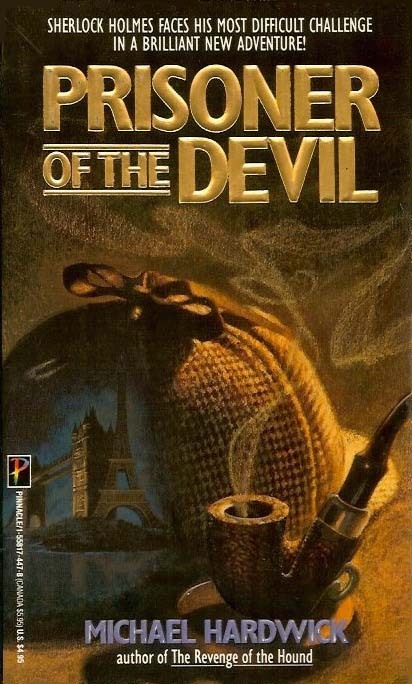 First published in 1979, this is a 1990 paperback reprint of Michael Hardwick's first Holmes pastiche. Hardwick also wrote the centennial Holmes novel The Revenge of the Hound and the novelization of The Private Life of Sherlock Holmes. ...and attends a seance to gather more information! For a reason known only to Her Majesty–and Holmes's brother Mycroft–the truth behind the trial and imprisonment of Alfred Dreyfus is of utmost importance to the Crown. Holmes had already turned down the family's pleas to investigate the Dreyfus Affair, a decision strongly supported by Doctor John Watson. But it did not take much of the great detective's world-famous powers of deduction to realize that the matter was more important than he had been led to believe. From what Her Highness had related to him, it was clear that what Dreyfus did–or did not–do would have an impact all over Europe. And just as clearly, Sherlock Holmes was the only man who could uncover the truth in time!